Canadian Natural has a large, balanced and diversified asset base, which facilitates flexible capital allocation decisions. 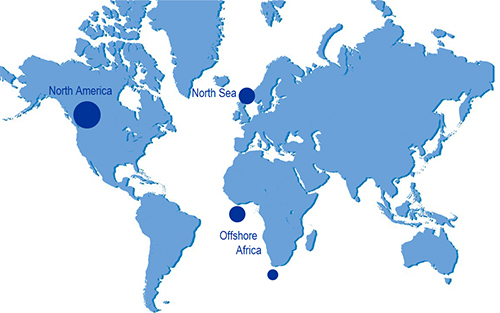 The Company’s North America operations serve as the foundation of our business, with operations in the UK portion of the North Sea and Offshore Africa providing international exposure and greater diversification opportunities. Our significant ownership and operatorship in our core areas supported by extensive owned infrastructure, allows us to be effective and efficient operators. Our strong financial position allows us to execute on value creation opportunities as they arise and to weather market volatility. Our transition to a Long Life Low Decline asset base demonstrates our belief in value growth and will result in maximum shareholder value for years to come. Another development in Canadian Natural’s world class asset portfolio is the Horizon Oil Sands Mining and Upgrading (Horizon). Rather than in situ production, Horizon includes a surface oil sands mine and bitumen extraction plant, complimented by on-site bitumen upgrading, ultimately producing high quality SCO. Canadian Natural holds extensive leases containing a massive resource base, with the mine and plant facilities expected to produce for decades to come without the production declines normally associated with conventional crude oil production. The Horizon Phase 3 expansion project is complete. On May 31, 2017, the Company successfully closed the acquisition of a direct and indirect 70% working interest in the AOSP and 100% working interest in other heavy crude oil and thermal in situ assets. The AOSP comprises of two oil sands mines, Muskeg River and Jackpine, which utilize a paraffinic froth treatment to produce diluted bitumen. This Bitumen is then shipped via the third party owned Corridor pipeline to the 70% owned Scotford upgrader. Canadian Natural has a 50% interest in Block 11B/12B offshore South Africa, approximately 200 km offshore between Mossel Bay and Port Elizabeth. The block is prospective for coalescing (deep water) basin floor fans, with amalgamated turbidite sand thickness potentially up to 150m based on seismic data, similar to that in the Forties Fan in the North Sea. As this is deep water with challenging sea conditions, Canadian Natural secured a world class partner for the deep water exploration of its Block 11B/12B with a 50% working interest and carry on the first exploratory well up to $150 million gross. The operator drilled the first exploratory well on the block in late 2014, achieving sufficient depth to retain the exploration right. Plans to re-enter the well are currently being evaluated by the operator.